The trick with making any Chinese food and it’s guaranteed success is to prepare everything before hand. You need to get all your ingredients together, chopped, diced, toasted, sauces prepared in little bowls, absolutely everything that belongs in a recipe must be at hand when you fire your wok up to inferno temperatures! The idea is to cook everything very quickly, on a high heat, so that all the juices, natural vitamins and minerals are sealed for maximum flavour and goodness. Not only are flavours and nutrients important in Chinese cooking, but texture also carries a high importance. 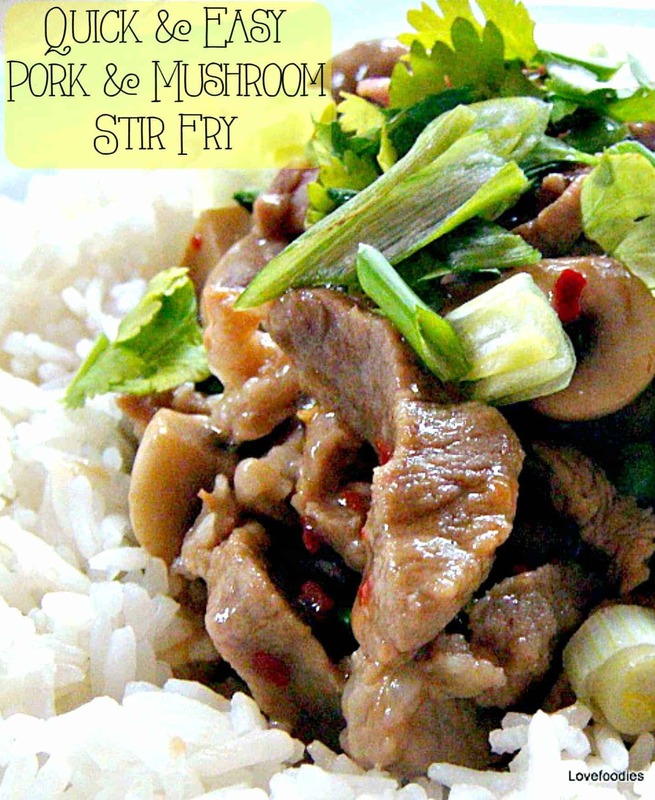 In this dish, you have the soft tender texture (yes, tender, not dry and stringy) of the thin slices of pork meat, against the crunchy slightly chewy cashew nuts, with a gentle sweetness from the peas, all married together with that distinctive light Chinese flavour sauce that comes with a stir fry. You can of course swap any of the meat and vegetables to suit what you have available, as always, our recipes at Lovefoodies are designed to be adapted and changed to fit in with what you like eating! 1. You need a wok! 2. 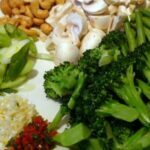 Get all your ingredients prepared and ready for the wok before you start cooking anything. 3. Serve with a bowl of Thai fragrant rice…mmmmm delicious! 4. When you are ready for serving, don’t hang around! the food must be served as soon as it comes out of the wok, for maximum taste and texture. 5. Quantities for vegetables can be as much or little as you wish. You can also change the vegetables to suit you. 1. Wash and prepare the mushrooms, they should all be cut to bite sized even pieces. 3. Put all your prepared vegetables on a separate plate as shown in the photo. 4. Slice the pork into thin bite sized strips (not cubes) and place in the bowl . Add the chopped ginger & garlic to the meat. 5. Make the sauce. – Add all the sauce ingredients into a bowl, and stir so that the cornflour has dissolved and add to the meat. 6. Heat the wok until it is smoking. Add a tablespoon of vegetable oil to the wok. 8. Add the sauce, stirring all the time and if the sauce gets too thick, add some water to loosen. 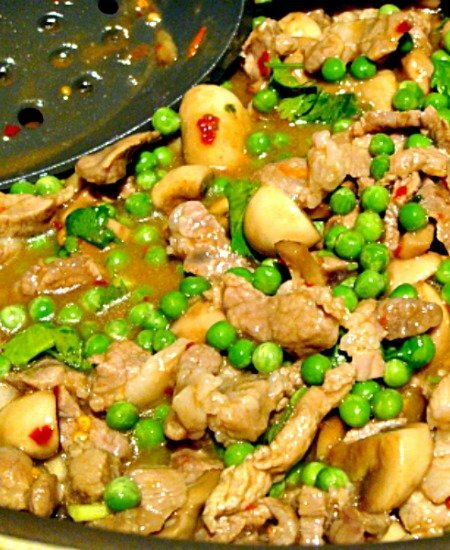 In this dish, you have the soft tender texture (yes, tender, not dry and stringy) of the thin slices of pork meat, against the crunchy slightly chewy cashew nuts, with a gentle sweetness from the peas, all married together with that distinctive light Chinese flavour sauce that comes with a stir fry. You can of course swap any of the meat and vegetables to suit what you have available, as always, our recipes at Lovefoodies are designed to be adapted and changed to fit in with what you like eating! Wash and prepare the mushrooms, they should all be cut to bite sized even pieces. 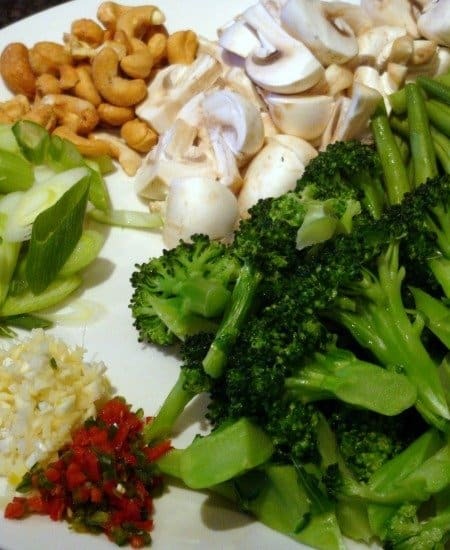 Put all your prepared vegetables on a separate plate as shown in the photo. Slice the pork into thin bite sized strips (not cubes) and place in the bowl . Add the chopped ginger & garlic to the meat. Make the sauce. - Add all the sauce ingredients into a bowl, and stir so that the cornflour has dissolved and add to the meat. Heat the wok until it is smoking. Add a tablespoon of vegetable oil to the wok. Add the sauce, stirring all the time and if the sauce gets too thick, add some water to loosen.